« ICRIR: Illegal Detentions of Iranian Refugees in Cyprus: Break the Silence! Young people ! Just they are looking for freedom not more ! 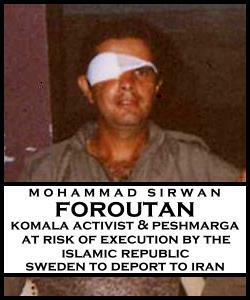 I cannot believe that Sweden’s intends refoulement of Mohammad Sirvan Foroutan, Everybody in Europe knows that he risks execution if returned to the Islamic Republic of Iran. Sweden must immediately cease all deportations to Iran.